September 2018 issue on sale now! | What Hi-Fi? However you source your music, the amplifier is a key part of your hi-fi system. The latest issue of What Hi-Fi? features some of the best amps on the market. To get the most from your music, you need the right amplifier at the heart of your hi-fi system. And as more of us choose digital music - CDs and streaming, mostly - the stereo amplifier remains central to the hi-fi experience. The inclusion of digital inputs and Bluetooth technology makes this one piece of kit worth spending plenty of time over when choosing your next upgrade. 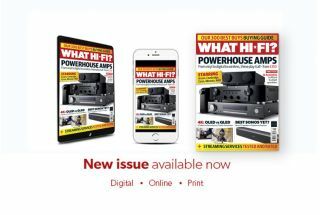 The September issue of What Hi-Fi?, available on the newsstands today, helps you to make the right choice of amplifier, with a round-up of some of the best digital-ready amplifiers out there right now. With reviews of amps ranging from £350 to £1000, you can choose your next upgrade safe in the knowledge you’ve made the best choice for your needs. Stereo amplifiers is one burgeoning area of hi-fi, particularly those offering digital and analogue connections. This means more choice, of course, but it also means your selection is becoming increasingly difficult. In the September issue of What Hi-Fi?, you will find reviews of the very best amplifiers on the market - along with some handy hints and tips to get you started. Our special amps feature begins with a round up of the best budget-to-midrange stereo amplifiers from Arcam, Cambridge Audio, Cyrus, Marantz and NAD, all costing between £350 and £1000. Want to know how your new amp will slot into your system? Our experts have come up with four alternatives. With system builder suggestions ranging from budget to premium (and an analogue alternative, too), there’s a system here to suit you. And we won’t leave you high and dry after you’ve chosen either. Read our feature on how to set up your amplifier and you won’t go far wrong. Streaming is the most convenient way of listening to music, with millions of tracks available at the click of a button. But choosing the right streaming service can be a tricky business. We put all the major music streaming services to the test – from giants such as Apple Music, Amazon Music Unlimited and newcomers YouTube Music, to hi-res challengers Deezer, Qobuz and Tidal. But can any of them knock Spotify off top spot? Whether your preference is for convenience, the widest musical selection or the best-possible quality, there’s a streaming service for everyone. Don’t miss our feature on the two television technologies of the day, as OLED and QLED go head-to-head. We compare LG and Samsung models to see which comes out on top, in what we’ve labelled ‘the TV battle of the year’. Elsewhere, we meet hip-hop legend Grandmaster Flash to talk about how his love of vinyl led to the pioneering scratch technique which formed the basis for the hip-hop sound – eventually creating a whole genre in the process. There’s plenty of non-speaker related hi-fi kit to read about the September issue’s First Tests section. This month, our lead review features the Sonos Beam soundbar. Plus, read our verdict on how the Beam compares to the company’s range of speakers, including the Playbar and Playbase. There are reviews of three pairs of stereo speakers, the Monitor Audio Studios, the Q Acoustics 3020is and the Heco Direkt Einklangs, plus the Audio Pro Drumfire multi-room speaker. We also review the Sony KD-49XF9005 TV, Sennheiser’s IE 80 S in-ear headphones and the Sonoro Meisterstück music system. There’s also a projector, the ViewSonic M1 and the Fiio Q5 DAC. And finally, we review the HTC U12+ ‘squeezable’ smartphone. Does this innovative approach make it a worthy competitor to the best smartphones around? In Temptations this month, we review the Nagra HD DAC/pre-amp and the Neat Iota Xplorer floorstanding speakers. That’s over £25k worth of kit - but there’s no harm in doing a little window shopping, is there? Our That Was Then feature looks back at the dCS Elgar Plus. How does this DAC, which dates back to 1997, compare with its modern counterparts? Plus: don’t miss our special offer – a free pair of SoundMagic E10C headphones (worth £36) – when you subscribe to What Hi-Fi? The September issue is not to be missed. So grab a copy of What Hi-Fi? from your local newsagents today. Or simply download it onto your tablet or smartphone. Enjoy!